Life doesn’t always happen in the same location. Co-workers, friends and even family can move away. If someone you know is going away, you want to send them off with the perfect present. Finding the right going-away gift isn’t always easy. Whether shopping for a co-worker changing jobs or a friend or family member who is moving away, you want to choose a going-away gift which is personalized, meaningful and even useful. Make your going-away gift one to remember with our guide to the Top 10 Going Away gifts in 2018. The seven-inch spoon is precisely made with an industrial-standard engraving machine. Features a sophisticated look which stays shiny regardless of how often its washed. The spoon also includes a gift box. 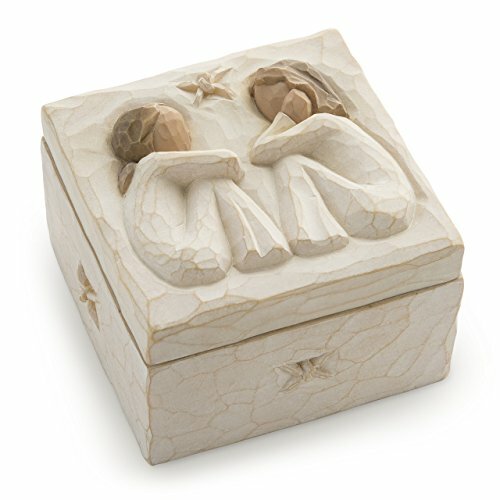 This small keepsake box features a bas-relief carving of two women sitting together and talking, making it the perfect gift for friends, sisters and other close relationships. The message “Forever True, Forever Friends” is written inside the box. Total size is three inches wide by two inches high. The Memory Box is based on an original wood carving by legendary sculptor Susan Lordi. Each sculpture in the Willow Tree line depicts healing, inspiration and comfort. You can even further personalize the gift by adding a small item to the inside of the box. Do you know someone who is moving to another state? 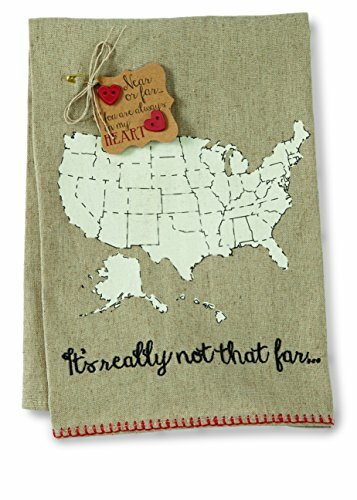 This printed linen hand towel features a map of the United States along with the phrase “it’s really not that far…” The towel is a rustic tan with a black-and-white country-wide map (including Alaska and Hawaii). Total towel size is 20 inches by 13 inches. Can simply be thrown into the washing machine on the gentle cycle. Plus, the towel includes a hangtag with the phrase “Near or Far, You are Always in My Heart.” Also includes two moveable red heart pins. The recipient can place one pin in their current location and another in their former state, symbolizing their connection to both places. Nobody says it better than your best friends and loved ones. 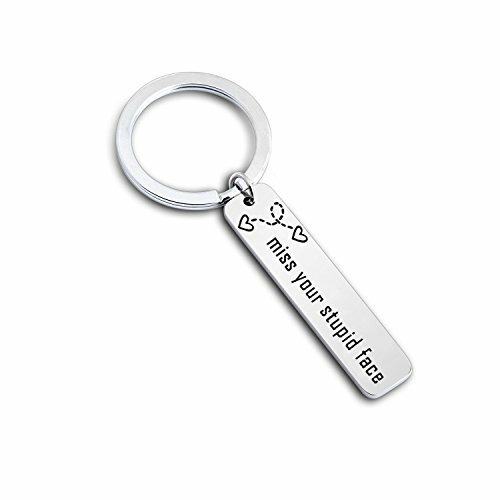 If you’re going to miss someone’s “stupid face” after they move away, let them know with this humorous keychain. The keychain is 1.97 inches long and made from hypoallergenic stainless steel. It won’t rust or change color. This is a great gift for anyone moving away into a new home. Every time they use their keys, they’ll think of how you love and appreciate them – and the funny slogan is sure to bring a smile to their face. Includes a gift box. 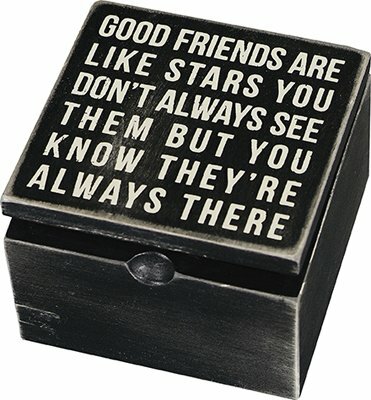 This is a small four by four box with an inscription on the top lid which reads “Good Friends are Like Stars. You Don’t Always See Them but You Know They’re Always There.” The words are printed in block white letters while the box itself is a shiny black. Made from high-quality wood with smooth metal hinges. Primitives by Kathy uses a purposefully aged style to create a classic rustic look which fits right at home on a dresser, desk, mantle and more. A delightful knick-knack with an inspiring and sincere message about the importance of friendship. This simple, elegant pendant is a reminder which your friend or loved one can wear whenever they’re not with you. Featuring a star-shaped cutout inside a gold-colored circle, the pendant is designed to resemble a compass. The pendant is made from zinc alloy with an 18-inch adjustable chain. Includes a message card which reads “When you are far away from friends and family, you have the courage and power to navigate your own way.” The necklace is great for any young lady setting out on her own for the first time. This 8.5-ounce soy candle burns for about 50 to 60 hours. With a light vanilla fragrance, it’s perfect for use around the home. All candles are homemade. 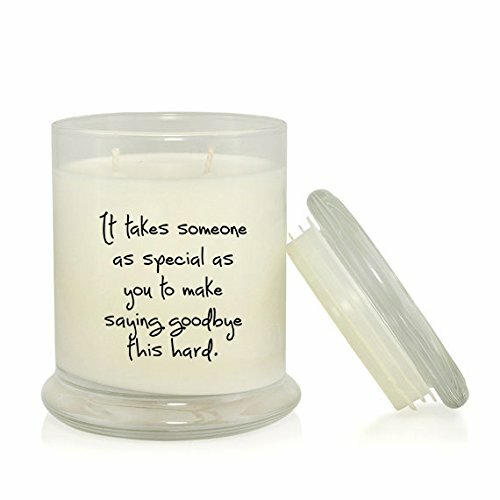 Written on the outside of the candle is the message, “It takes someone as special as you to make saying goodbye this hard.” Although marketed as a retirement gift, also works great for anyone embarking on a new journey in life. 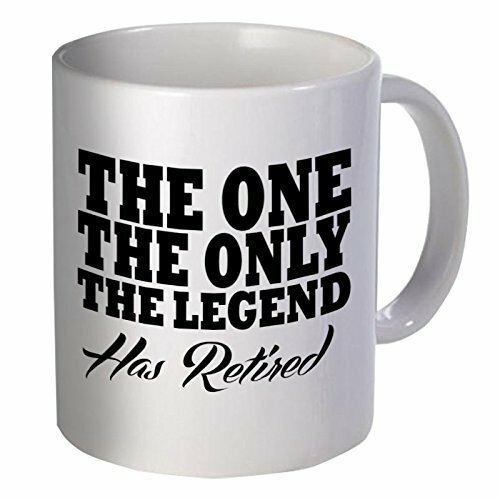 Send a retiring co-worker off in style with this hilarious coffee mug. Printed on the side is the message, “The One. The Only. The Legend. Is Retiring.” This is an 11-ounce ceramic mug with a large C-shaped handle for easy grasping. The ink on the mug won’t fade over time, even after repeated washing. Mug is strong enough to handle all temperature extremes from hot coffee to iced water. Can be used safely in both the microwave and dishwasher. If you know someone who is about to retire, these comedic business cards are the perfect gift. What looks like a normal business card at first is actually a gag “Out of Business” card. Noted on the card are non-existent office hours as well as no email or phone numbers. This gift is great for any retiring professionals. 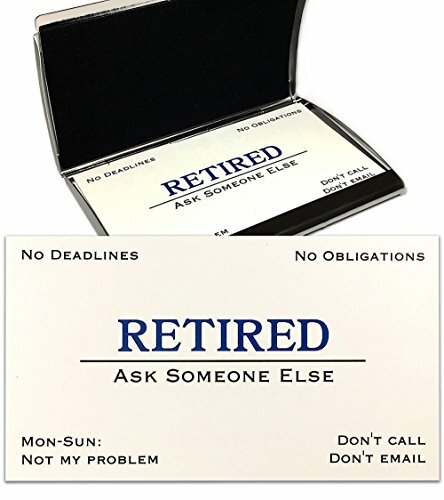 Cards can also be ordered with a stainless-steel case engraved with the word “Retired.” Keep in mind these cards are only funny if the individual is leaving the company of their own choice, and would be considered poor taste if they were laid off or fired. The design is permanently printed and perfectly safe for repeated use inside the dishwasher and microwave. 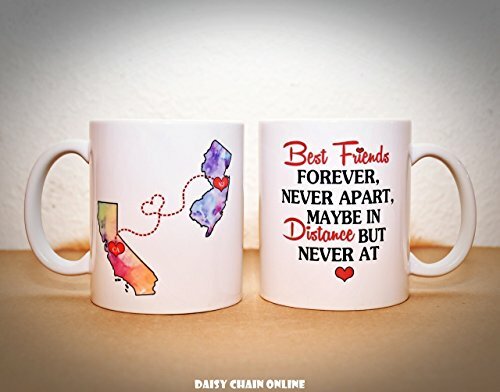 When you have two mugs, you can create a special connection across distance. Using the mugs lets you pause and think about one another. Saying goodbye to someone isn’t always easy, and finding the right going away gift can be even more of a challenge. After all, you might not see the person again for a long time, if ever. So you want to give them a gift which they’ll remember fondly. You also want to make sure the gift is appropriate for the specific situations. There are many different reasons why you might need to purchase a going away present for someone. Who you’re buying the gift for, and why, will determine what exactly type of gift is best. Your relationship with your co-workers can vary significantly. Some co-workers might be considered close, personal friends. Other co-workers might be people you have little contact with aside from a smile and a nod in the hallway. When shopping for a co-worker you know well, always keep the gift tasteful and office-appropriate. Even if you and your friend have a more “off the clock” sense of humor, avoid gifts which contain swearing, alcohol references and other topics which are off-limits in a professional environment. Of course, you can always give them a second gift later in private. Buying a gift for a co-worker you don’t know very well can be a bit of a challenge. Play it safe by choosing a going away gift more on the generic side. This could be a simple mug, gift certificate to a nearby restaurant, or other small token which almost everybody will appreciate. Another option in this situation is to chip in on a group gift with a few others. A co-worker’s retirement can bring about a mixture of emotions. On the one hand, a beloved and experienced co-worker will be missed. But that co-worker is also entering retirement, which is often a cause for celebration. Avoid retirement gifts which make jokes about old age or a lack of purpose in life. That can be insulting to the recipient. Instead, choose gifts which take a lighthearted approach by highlighting how the person doesn’t have to worry about work anymore. Be sure the gift reinforces the idea that the person will be missed around the office once they’ve retired. If a co-worker, friend or family member is moving to another city or state, you’ll want to get them a goodbye gift before they leave. There are two basic types of gifts which are a good choice in this situation. First, you can give items related to where the person is going. A travel guide, map or other objects related to the new city can be fun and helpful. Gift certificates for restaurants or popular tourist spots in the city are also a nice gesture. The second type of gift focuses more on creating lasting memories about your time with the person. This could be a scrapbook of photos or other memories. You can put these personalized items into a keepsake box such as the Willow Tree Memory Box. Even something as simple as a pendant or a spoon can be a great gift. While the item itself is pretty common, the gift can help maintain a connection. 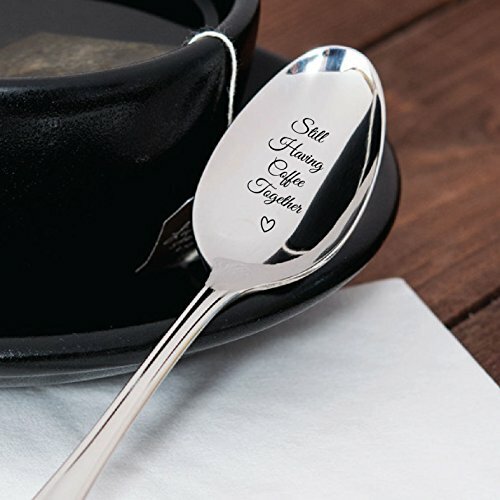 For example, every time the recipient uses a special spoon to stir their morning coffee, they can also stir up memories of the gift-giver, even if the two people are separated by a great physical distance. Traditionally, gifts between co-workers are usually given in the office or during a retirement party. More personalized going away gifts given to a loved one should be given privately. Avoid creating a public display of any going away gifts if the recipient is especially upset or anxious about leaving their current situation. If you know someone who is moving to a new city or state, consider sending a welcome home gift to their new address. A basket of fruits, meats or other snacks can be a wonderful surprise to a new homeowner. Plus, a food basket can be really helpful for someone who isn’t familiar with the grocery stores and restaurants in their new area. When someone moves or retires, they don’t really need a keychain, spoon or similar small item. However, a going away gift is less about necessity and more about feeling. The best going away gifts make the recipient feel valued and appreciated. Co-workers want to know that their time spent at work was appreciated. Aim for gifts which talk about how they were a great employee who will be missed. Generally, avoid gifts which make jokes about the person being a bad worker. That type of humor can be taken the wrong way, and you don’t want to accidentally create the wrong impression. Goodbyes can be difficult – but finding the perfect going away gift doesn’t have to be. Keep the gift positive, keep it appropriate to the situation and, above all, make the person leaving feel valued. A going away gift doesn’t have to be expensive or complicated. Even something simple can create a personal connection while the recipient will take with them on their new journey.